"Can I get a ride?" Saeed Ahmad asked casually as the cab pulled up. A Brooklyn man is being charged with manslaughter after he left his date to die inside his burning, crashed car as he left the scene in a cab. 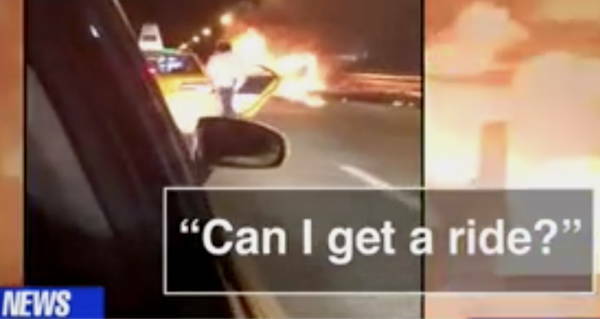 In a video taken by a stopped car nearby, Saeed Ahmad, 23, can be seen hailing a yellow cab after escaping his burning vehicle on the Brooklyn-Queens Expressway at about 4 AM Friday morning. His passenger, 25-year-old Harleen Grewal, was still inside. “Can I get a ride?” Ahmad asked casually as the cab pulled up. He was taken by the cab to the hospital to be treated for burns on his neck, arms, and face. When firefighters arrived on the scene, they extinguished the burning car and discovered the remains of Grewal inside. She was pronounced dead at the scene. Ahmad admitted to NYPD officers that he had had a few drinks before the crash, the cause of which remains unclear, but his blood test revealed that he was not legally drunk at the time. Furthermore, his friends and family insist that he sustained the burns on his arms from trying to save Grewal. Ahmad told the NYPD that he was dating Grewal, though his friends said he was an acquaintance who gave her a ride home. The victim’s family has expressed outrage over the video, and Ahmad’s treatment of Grewal. Grewal’s boyfriend, Karan Singh Dhillon, also took to social media to express his grief. In addition to being charged with manslaughter, Ahmad is also being charged with criminally negligent homicide, leaving the scene of a fatal accident, speeding, and driving with a suspended license. Next, read about the man who burned down his house while trying to eradicate ants. Then, read about the man who sparked a wildfire by burning books.